Okay, here is the skinny of it - I've completely stopped using my dishwasher since the manufacturers took out that amazing chemical(s) called phosphates. I know, it's bad for streams or something like that but my dishes were horrible when I used the phosphate-free stuff! So, much to my children's dismay, we've been hand washing our dishes for nearly a year now. 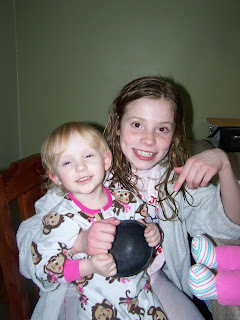 It wouldn't be so bad but we have a big family PLUS we operate a daycare in our home. This translates into a LOT of dishes! I've been telling my kids that it's not so bad but secretly, I've been not liking the hand washing method so much either. As usual, I didn't have all the ingredients so I had to change it just a bit. The original recipe in the above referenced recipe called for Kosher salt and citric acid. Also the amounts were different. Mix well and store in airtight container Use as you would any powdered commercially available dishwasher detergent. I also put vinegar in the "jet dry" compartment to help as a rinsing agent. Two of my girls holding a still damp bowl from the dishwasher. The youngest is just happy but the older of the two is smiling because the bowl is clean and NOT greasy! To her, this means Mom will stop making them hand wash all of the dishes! This is great news to a 10 year old!!! This is great news to Mom too! ﻿I must say, I've been pretty excited about my new discoveries lately but this tops all! I wanted to post this tonight so I didn't take the time to figure the cost but I suspect it will be much cheaper than store bought dishwasher detergent. I'll figure it out soon and post a follow up. I do hope you'll let me know if you try this recipe and how it works for you! P.S. 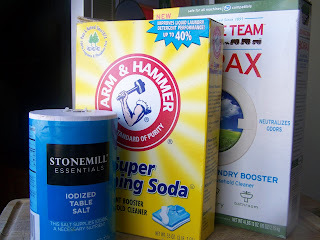 I've had some folks say that they couldn't find Arm & Hammer Washing Soda. I did find mine at Walmart but you can order it online as well. 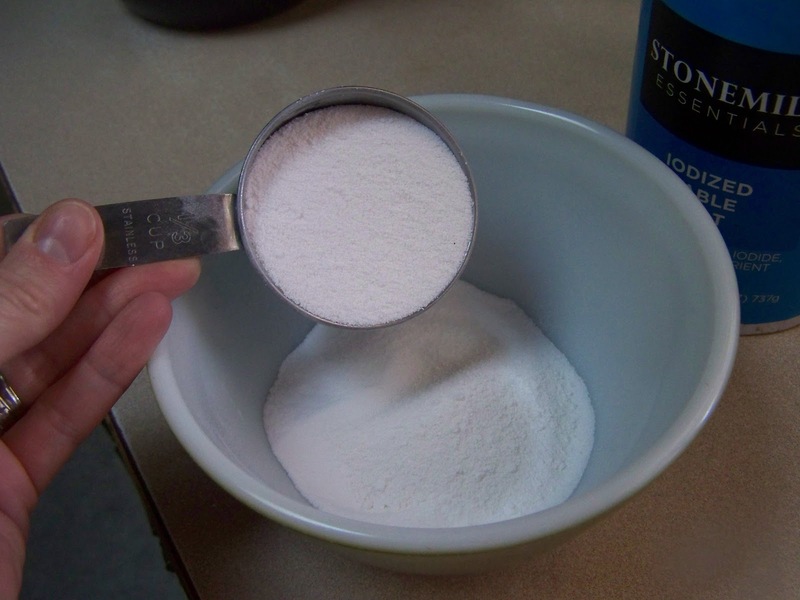 Since I originally published this article, I've had several friends suggest adding trisodium phosphate to the detergent. Apparently a teaspoon or so added to each wash eliminates the buildup and greasy gunk left behind from the phosphate free detergent. This would make sense as trisodium phosphate is PHOSPHATE!!! It is my understanding that while it is illegal for phosphate detergent to be sold, it isn't illegal to use them. I know that you can purchase it here - Savogran 10622 Trisodium Phosphate (TSP) . I would think that a box this size would go a long way if you are only using less than a teaspoon per wash. Yet another update ~ We moved to a new house with very hard water. My detergent just wasn't cutting it so I caved in and tried the trisodium phosphate. See the results here. We just tried it today Adrienne but I will definitely post updates! I don't know if it will start to gunk up over time but today's wash was surprisingly good! I'd been so frustrated with our phosphate free stuff that I'd just given up on using our dishwasher. We don't have a great dishwasher either, just an average one. I wonder if the variation in the amounts of the ingredients made a difference... Well, if you don't mind, let me know if you try my version. I'd love to know how it works for other people too! Perhaps try the Lemi-Shine in your recipe, just as DIY Natural suggests. You're very welcome! Let me know what you think of it! Thanks for stopping by! What a great idea. Thanks so much for finding and following my blog. I have just followed your's back. Thank you so much Laura, for stopping in to say hello! I appreciate you following as well. Hopefully I'll have some tips you will enjoy! Thank you for visiting and following my blog. I am so happy to meet you. I am very sensitive to chemicals and smells and try to use a homemade, more natural type of cleaner whenever possible. I do make my own laundry soap, but have never heard of a recipe for the dishwasher. I do believe I will try it. I already have the Borax and washing soda in the laundry room because I make my own laundry soap too! Thanks so much for sharing. I got such a kick out of your 10-year-old daughter. Both girls are beautiful, but that big smile and those huge dimples are just wonderful. Tell her I am happy for her that the dishwasher is back in action! Otherwise get them some really cute gloves, that always helps. I like to use a handmade washcloth, that makes it more fun for me too! If you don't already, maybe you can read my posts on knitting a washcloth and teach the girls to make their own! Thank you for visiting! I do hope you'll give it a try. It honestly is working for us! I hope over time it doesn't disappoint (with a build up or anything) but so far I am really impressed. Thank you for the compliments on my girls. I am blessed to have three girls (all beautiful little sweethearts) and three handsome boys. I am a very lucky mama! The cute glove idea is a good one, as is the handmade washcloth idea! I'll check out your posts in a bit on knitting a washcloth. Clever lady! Way to go Poppy, glad you like the recipe. God bless! It's such an honor to get a visit from you! You have no idea how much we love the recipe. My children are cheering in the kitchen at this very moment! I'm just so surprised at how well it works. I honestly had given up on using my dishwasher until now. You're a life saver! Now this is pretty cool. I have been thinking of making my own detergent, then I saw your comment on my blog and I pop over here and lo and behold, you have the recipe. WOW thanks so much. Oh, good! I'm so happy you found what you were looking for. I can promise, you won't be disappointed with the laundry detergent. Or the dishwasher detergent! I was hesitant to make my own laundry soap because years ago I'd tried a recipe and was not thrilled with it but I'm so glad I gave it another shot. This recipe is cheap and effective! Thanks for stopping by Christina, I hope you're getting all settled into your new home! PS like the dishwasher detergent recipe too but had to have the laundry recipe. Thanks so much for the visit! I do hope you'll let me know if you try this. I am usually not so excited about cleaning products but this one seems to be a keeper! I do hope I'll have some helpful and interesting tips you can use in the future! I'll be by to see you again soon! I don't think I'll ever forget getting our first 'automatic dish washer'. We would have to roll it over to the sink and hook it up to the sink faucet to run it and we had to wash the stuff off the plates before we loaded them into the dishwasher and we still hand washed the pots, pans and when we had company the 'good' silverware. The best part about the dishwasher, however, was how the rinse cycle killed a lot of germs and cut down on colds and flu bugs. In a family with six kids and mom and dad, it sure made a difference in missed school days and work days plus a lot of nursing time for our stay at home mom. This was about 55 years ago. Thanks for bringing back this memory to me Poppy! Don't the vinegar and soda foam all over the place or etch the dishes after a while? I just got a new dishwasher and they were really specific about what to use in it. I would love to try this but I don't want to mess things up. I washed dishes by hand for a couple of weeks while we dried out the floor underneath when our old dishwasher leaked and died. I didn't mind doing them this way but there are only two of us. I will consider this homemade dishwasher soap. Thank you. Do you know how wonderful your blog is?... All kinds of great ideas. I don't know if washing soda would react with vinegar in the same fashion as baking soda, however, I think because I'm using the vinegar as a rinse agent, the two products are not coming into contact with each other. Of course, you should not put anything into your new dishwasher that might void your warranty. I must say that I am surprised how well this actually works. We are skeptical people by nature and I was prepared to be disappointed. I'll be paying attention over time to the condition of my dishes and update everyone if it's anything less than great. Thank you so much for the vote of confidence! I am so new to blogging and hope that I'm doing justice to my goal of offering helpful information and encouragement for frugal and independent living. Your visit is much appreciated! I'm so glad you took the time to visit me! Yes, we had one of those dishwashers too! I remember my sister and I wanted Mom to get a dishwasher so badly! We were tired of drying dishes (Mom always washed). Mom said we'd miss talking while we dried the dishes and she was right! It was nice to have the dishwasher of course! But then it was just one of us in the kitchen at a time. A tad bit lonely at times! Thanks for taking me down memory lane! Have a wonderful day tomorrow! I have been noticing that my dishes haven't been coming as clean. I will definitely try this out!! I've recently made my own fabric softener and baby wipes and am VERY EXCITED about these money saving additions to my house. I cna't wait to see how this works!! Since it's been about a week now, how do you think it's held up? Love your blog...I'm your newest follower!! Hi Melissa! Thanks so much for stopping by! I can HONESTLY say that I am impressed with this homemade dishwasher detergent. I couldn't tell you if it's the ingredients in the powder, the ratio of them together (even amounts of each) or perhaps the combination of the detergent with the vinegar as a rinse aid. I just know that my dishes are virtually spotless and not a trace of film that we were experiencing with the commercial detergent. Out of all the things I've experienced with lately, I'm most excited about this one! Then it would be followed by the homemade fabric softener (the Purex Scent Crystals added version). I'd love to know how you make your baby wipes since I go through a ton of them! Thanks again Melissa! Hope you'll stop by again soon! Awesome!!! Glad you found me!! I'll have to try adding salt to my borax/washing soda combo I use. They're clean, but there's a cloudy residue that we haven't been able to get rid of, even with Lemi-Shine. Saw your reply with this link at Homestead Revival, TFS! Thanks for stopping by! Definitely give this a try. I honestly don't know if it's the salt, the vinegar as a rinse agent or the combination of them all but it's working. In our home, because we have a large family AND a daycare, we run our dishwasher 2 to 3 times a day MINIMUM. So, we're definitely doing our product research! The salt is the only thing we aren't currently using, so my guess is that's the item making a difference. It makes sense too-salt is used to soften hard water-and that's what's leaving the residue in our case. Well, then that must be it! Please do let me know how it works for you! I'm hoping it will work for other folks as well as it is for us! Hi! This is a great site! I have read that the citric acid the originally called for helps with the cloudiness of the glasses. According to Tipnut.com an alternative to citric acid is unsweetened lemonade. They say sub about 10 to 15 packs for 2 oz of food grade citric acid. Hope this helps! I'm so glad you stopped in to say hello! I do have a Facebook page, it's under the same name as my blog. I need to figure out how to link the two. (I'm so new to all of this). I cannot stress enough how thrilled we are with the homemade dishwasher detergent. We - husband, kids and me - just get so excited everytime a load is finished! What does that say about the excitement level in our lives? We must be easily entertained! Good luck finding washing soda, I actually found mine at Walmart of all places! I think I figured out how to put the link on my blog but here it is just in case the link doesn't work! I hope this works for you and I really do appreciate your support! Your welcome Heather! Thanks for "liking" my Facebook. It's still very much under construction. I'm planning on posting from other informative sites, so it won't be just me "rambling on"! I don't use my dishwasher very often, but willing to try this out. I don't think you will be disappointed! Thank you so much for stopping by! Have a wonderful day, Audrey! Hmmm... So I just tried this today because I've been looking for a natural version that doesn't require a lot of ingredients, and I have no citric acid. My glasses came out cloudy. Any suggestions? I did use vinegar for the rinse also. Hi Geniene. I just saw your comment. I actually had the same problem and had to discontinue use of my homemade dishwasher detergent. :-/. I've found that Finish does a great job, of I'm going to HAVE to keep buying the stuff. Much to my dismay, I began seeing a slight film on my glasses too. Even with the use of vinegar. But I stopped putting the detergent in both dispensers, now I'm only putting it in the pre-wash dispenser (still using vinegar). I'm back to pretty satisfied. Although, not as thrilled as I was before. I bought some citric acid last night to see if I can help clean the years of hard water build up out of my dishwasher. Very frustrating process isn't it? I'll post in a few weeks to let everyone know how it's going. Ive been making my own dishwasher detergent for a year and a half an it works great it is equal amounts of baking soda oxyclean and any powder dishwashing detergent you want to buy.Ive used the dollar store brand and cascade an made some last night with great value.I use lemi shine in the main cup with the detergent i just sprinkle a little in the cup.Ive tried the mix of borax an washing soda but I just get dirty powdery dishes.This isn't as cheap but I think it stretches the detergent out to last longer/I just bu the cheap oxyclean the sun brand i think its a couple bucks and baking soda is cheap I make it in a big container and it lasts a long time.I hope some of that are having troubles with other recipes will try this one and like it as much as i do. But..... Oxyclean is sooooooo bad for the environment and not recommended if you have a well. Good Morning! In response to your comment that you notice a build up of some white gunk... maybe because you are using the regular iodized table salt... the Kosher or Sea salt may actually work better at softening the water without build up. You could always buy the store brand of table salt that does not have the Iodine added which may help. Also putting a few drops of Dawn in there would cut the grease/ film build up :) Love your idea's!